Will – Definition: A Will is a written document which states to whom a person’s belongings, money and property are to be given upon death. A Will is typically effective upon a person’s death. A valid will may either be typed or handwritten (holographic). Testator/Settlor. The person who makes the will is commonly referred to as the “Testator” or the “Settlor”. After the person dies he/she is sometimes referred to as the “Decedent” in legal terminology. If a person dies without any will, the word “intestate” is used to describe the situation. Heirs. The persons who are to receive money and property upon the death of the Testator are known as Heirs. The Heirs are typically the persons named in the Will but sometimes persons who are not named in the Will have a right to be Heirs as well. A common situation where non-named persons are Heirs is where a child of the Testator has not been named in the Will. In that case, the legal presumption is that the Testator forgot that child so that child then legally becomes an Heir. Also, if the Will is invalid or if there is no Will, the Heirs are those persons entitled to inherit under the laws of California found in the Probate Code. Executor. The person or institution that takes care of the money and property of deceased Testator is known as the Executor. The Executor is bound by law to follow the directions contained in the Will. Guardians of the Estate and Person. Where a Testator has minor children, the Will can specify who is to care for his minor children. The person who has the physical custody and care of the children is the Guardian of the Person. Either the same or a different person can be designated to handle the money and assets that the children are inheriting from the Testator and is known as the Guardian of the Estate. Since Guardianships only last until the children reach age 18, Testators often choose to establish some kind of trust to safeguard the money and assets after age 18. Decedent’s Estate. The decedent’s estate is all of the money, property, assets and belongings that the Testator still owns at his death. The Will thus controls the disposition of the Decedent’s Estate that exists at the date of death. 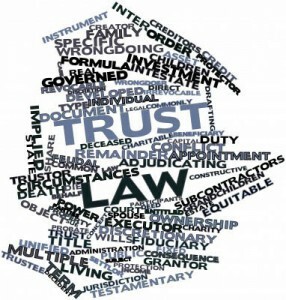 Testamentary Trust as part of Will. The law of Wills allows the Testator to establish a trust for some of all of his assets as part of the Will. This would be typically done to have some or all of the Decedent’s Estate held and managed for Heirs who are under age 18 and also to be able to have them held and managed for the years after age 18. Testamentary trusts have to be managed under Probate Court supervision with filings and reports to be made to the Court periodically.